There is a certain well-known vegan company that makes a certain peanut butter product that is almost certainly laced with crack cocaine, because it is so certainly addictive. I kid! Seriously please don’t sue me. I just really, really adore that coconut peanut butter in a really really addiction-level way. Sweet and smooth and oh-so-rich, it’s a perfect balance of peanut buttery goodness and coconuty awesome-sauce. It. is. amazing. But man that stuff is pricey! Also palm oil, oof. So I set out to make a dupe . . . and I did! Only three ingredients too. This recipe tastes fantastic, but it’s also inexpensive and devoid of any moral quandaries. Win – Win – Win! Next, add half a cup of coconut butter. Coconut butter =/= coconut oil. They are different! Coconut oil is just that – oil, which is extracted from the coconut meat via pressing. 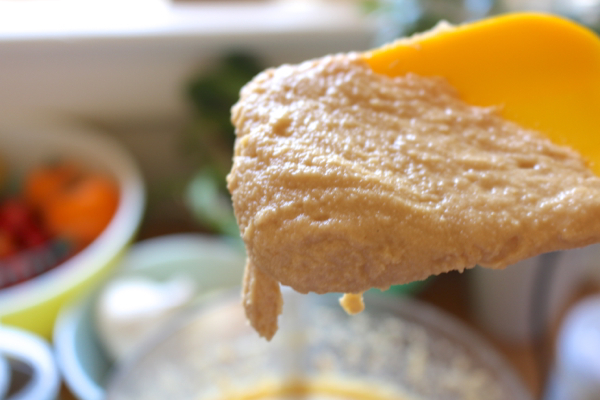 Coconut butter, on the other hand, is made from blending up the meat into a smooth paste. So the butter has a thicker texture, and includes more nutrients – it’s a more “whole” food. 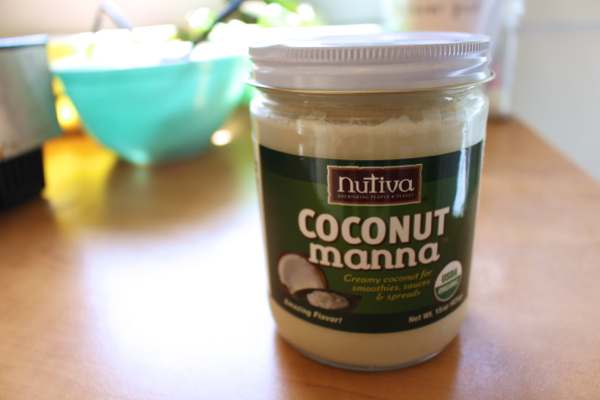 There are a number of brands of coconut butter out there, but my favorite by far is Nutiva’s Coconut Manna. The richness? Ridiculous! Now you’re going to blend like a mofo. I mean it, making homemade nut butters is serious business. 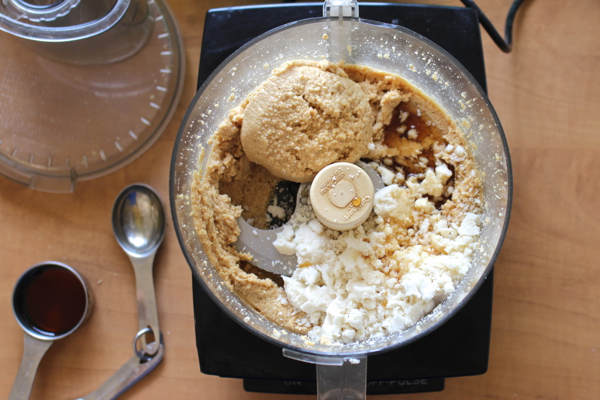 You’ll need to let that food processor just keep on working. The butter will move through a variety of textural phases, like a crumbly stage, and that stage where it all clumps up in a big ball that circles the bowl on the blade. Keep going. And then you’ll be like SERIOUSLY THIS IS TAKING FOREVER IT HAS TO BE DONE ALREADY but nope, keep going after that. At some point the butter will relax. Just like that, in an instant, the whole thing will sort of melt and the blade will run smoothly through and it won’t be changing consistency anymore – it’ll look like gooey creamy smooth butter. You’ll know it when you see it. Trust me. So congrats! That’s when it’s done. Taste test it and see if you want to add another tablespoon or so of agave – that’s just a preference thing. When you’ve got it adjusted how you like it, transfer the whole shebang into a big glass jar. Make sure you eat plenty of the sticky sweet goodness along the way. You’ve been working hard, after all. You deserve a treat! Coconut butter will keep in the fridge for ages. Enjoy it on oatmeal or overnight oats, on pancakes or sweet pudla, on toast or fruit, mixed up with chocolate chips or hey – just off the spoon! That’s how I usually do it . . . Awesome!!! I’m addicted to that coconut peanut butter too and just realized last week that it had palm oil in it. I’ll have to try your version! mmmmmm that looks soooo god! Oh man … that looks amazing! I’ve never heard of coconut peanut butter before, but as I have an addiction to both coconut, and peanut butter, I’m guessing I’d also be in love with this one! Making this over the weekend! So glad you put this recipe up – I’ve been meaning to whip up something similar, but didn’t know where to start because I haven’t tried the expensive product which shall not be named. (And winging it could quickly get expensive.) 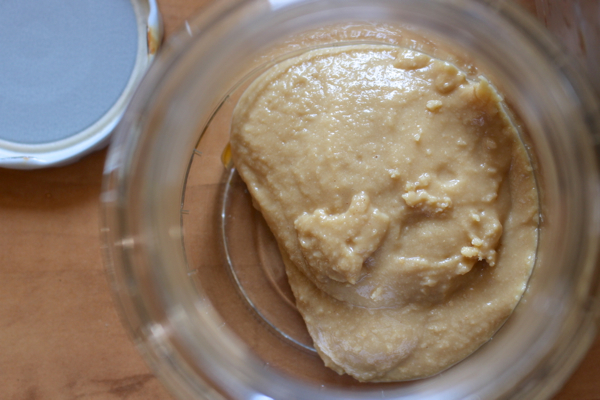 I’ve been avoiding palm oil for so long (well, only two or three years but in Nina Years it is a long freaking time) that I put homemade vegan butter into our old Earth Balance containers. I hope Daiya and EB create palm oil free versions of their products SOON. Do you think this would work with almonds? My youngest hasn’t had peanuts yet. I love that brand of coconut butter; I’ve been mixing it with tahini, molasses, and dates and plopping in with my baby’s oats and quinoa. Hey Stefanie, if you end up making it with almonds would you mind posting results here? I’m probably going to make it with cashews and was wondering the same thing about using different nuts. 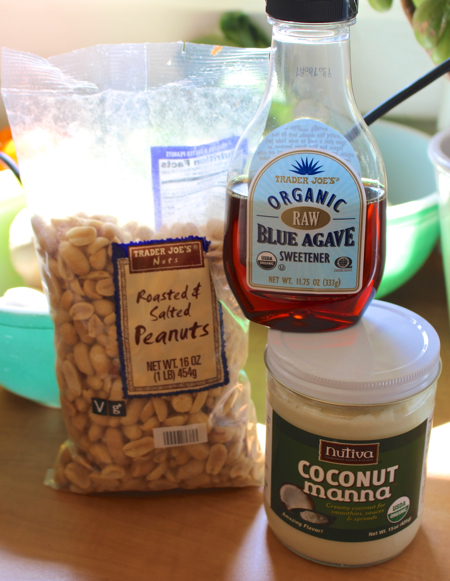 My biggest concern before seeing Say’s recipe was the ratio of coconut butter to nuts. This looks soooo good! Need to get my paws on some coconut butter. I made homemade nut butter for the first time this weekend. Chocolate coconut almond butter. 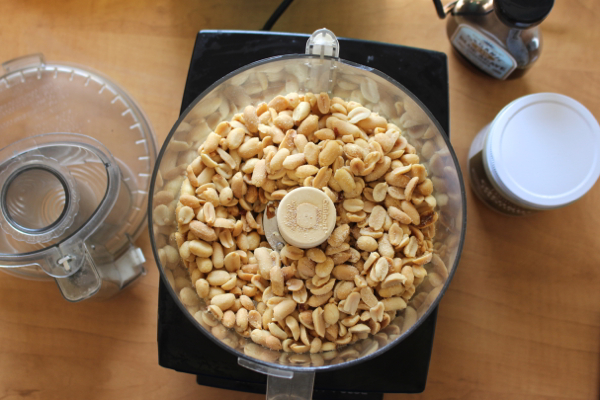 I thought I was going to burn out the motor on my food processor :) And I finally figured out the key ingredient – patience! Coconut-peanut sounds the best! 2 for 1 deal :) I make my own coconut butter so I’m wondering if I could sub in for store-bought. Any thoughts? Just tried the store bought coconut-peanut butter for the first time a few weeks ago, and I was hooked. For my pocketbook, this recipe could not have come at a better time. This looks so good. 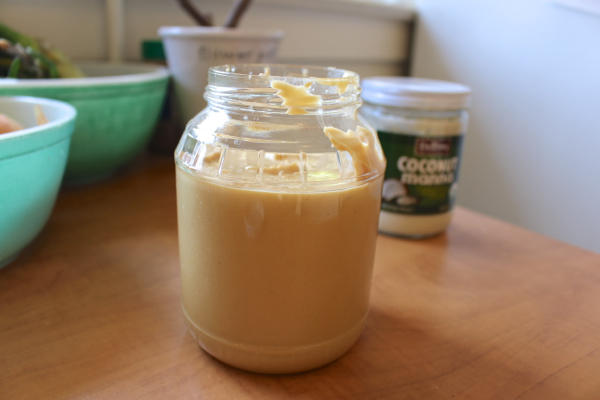 I love peanut butter and I love coconut butter so I imagine this will be something to love also. The mystery of the peanut butter-coconut product that shall not be named is eating me up. Do we have it out east? Anyone? I’m so intrigued. Or perhaps I shall never know and forevermore label my homemade jar of pb-coco goodness: Bonzai Dip! I just made this and it is AMAZING!!! I think I know what I will be making for Christmas gifts this year! I especially love that it is not made with palm oil! Emily, what a great idea! This would make an awesome holiday gift… I wonder if it would ship well? Maybe that’s a stupid question (meaning is it suppose to be refridgerated immediately)? Do you just throw the coconut meat in a food processor and vala! coconut butter? Is it cheaper that way than buying a jar of it? I’m just asking since I live out in the middle of nowhere Texas (yes, I’m 1 1/2 hours from any suitable grocery store, no joke!) and it may be easier to buy coconuts than a jar of coconut butter. Yes please if you use almonds, let us know how it turns out. I also have an abundance of cashews in my pantry and would probably just use those instead of peanuts also. I like the vegan butter recipes on both veganbaking.net and vegan.com, and make them based on which ingredients I have on hand. The banana version of veganbaking.net’s recipe is amazing in pastries and tea cakes. I LOVE that EB coconut PB. But homemade (and palm oil-free) is even better!!!!! Two words. Rhymes with Dearth Valence. Haha! It would definitely work, in terms of being functional and I’m sure very tasty. It would taste different, of course, but it would definitely *work* with any nut butter. Let me know if you try, yeah? It is! 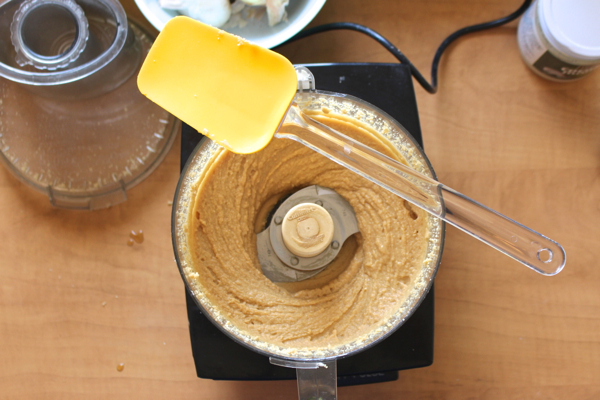 All about patience for the homemade nut butters. 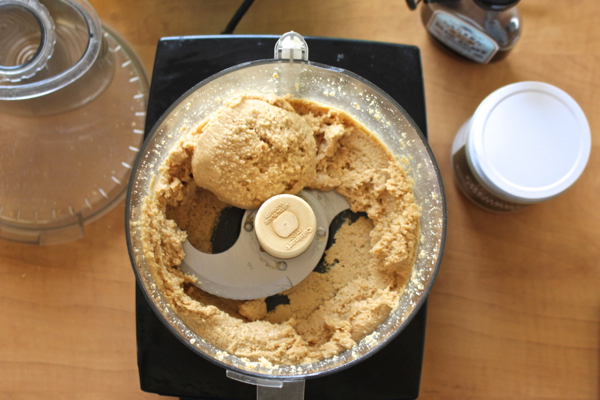 You can make your own coconut butter by putting dried shredded (unsweetened of course) coconut in the food processor and just blending it into t butter, like you would with nuts. Just the plain coconut shreds you can buy. I do refrigerate it, not sure ho it would keep unrefrigerated. I don’t think I would risk it. hey there. i was googling for ratios to do a copycat of another popular brand that rhymes with shmopical shraditions (2 ingredients: coconut & peanuts, in that order). thanks for posting this, but my OCD won’t let me leave without commenting … the “mystery” brand to which you refer actually contains coconut OIL, not butter. in fact, i’ve read several reviews (by obvious coconut haters) that say “you can’t taste the coconut” .. duh! ;) thanks again! I am allergic to coconut meat but can handle coconut oil, could I substitute the coconut butter for coconut oil and come out with a similar result? Hi Bianca, so coconut oil would definitely not act the same in this recipe. I’m not sure what the result would be – probably tasty but with a much different texture, and it may separate over time. I’m not sure, but I do know for sure that coconut oil and coconut butter are not interchangeable – it’s like the equivalent of peanut oil and peanut butter. This sounds great! I have some homemade coconut butter sitting on my counter, and I’ve just been waiting to find a good way to use it. Yum! 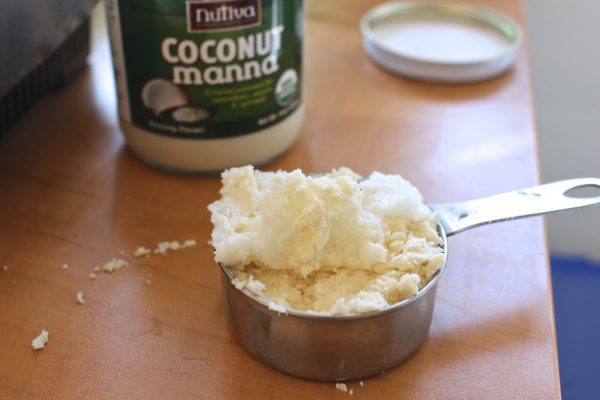 Is coconut butter the same stuff as raw virgin coconut oil? Or could I use this instead? Definitely not the same thing! You cannot sub coconut oil in this recipe. This recipe is fantastic. I used caramel roasted peanuts instead. Omg so good. Thanks for posting. Thanks for this recipe! How long would it last at room temperature? If I made it as a gift and mailed it to someone would it be okay…? Thanks again. That’s exactly how I plan to use this recipe as well. Happy bellies this holiday season! This worked well for me. As an experiment, I cut the recipe in half. I used a solid honey that is produced “locally” (Big Island, same state as us here in Honolulu) instead of agave nectar. So far it has passed the knife-licking test; we’ll see about the bread-spreading test tomorrow morning.